Recent breakthroughs in technology have expanded the possibilities for where data is gathered, processed, stored and analyzed. IT staffs and their business counterparts now have the flexibility of deciding whether their applications are more efficient residing in the cloud, within a traditional data center, or on the network edge. In fact, for the first time, the nature of the applications themselves is determining where they best should run. Over the last several months, micro data centers have emerged as a technology of choice for helping to manage the growing computing needs across edge environments. In some environments, edge computing is helping business organizations to reduce the need for transmitting data back and forth across networks, thereby reducing bandwidth costs. Some applications, where latency is an issue, may not be suited for working efficiently in cloud environments. Other situations, where unstable network connections result in too much remote location downtime, can also be avoided. In remote retail store locations, for example, the cash registers can’t afford to stop ringing and recording customer sales if the cloud network experiences an interruption. For store managers, idle employees and frustrated customers represent loss of both current and future business. Such a use case makes a strong argument in favor of edge computing when local management is placed in a more flexible position for maintaining a higher degree of business continuity. As the interest in edge computing grows and expands, decisions need to be made as to what kind of systems best support such environments. In addition, who will support these systems once they are installed? After all, in many locations such as retail outlets, banks, small offices, and manufacturing sites, no IT staff is on hand to offer data center expertise and support. Perhaps the most important benefit of a micro data center is its flexibility to be used in a wide variety of applications. 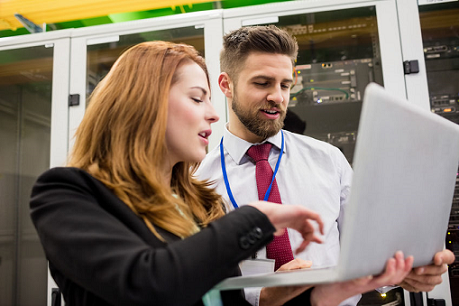 Individual micro data center solutions can be tuned to simplify solving core business challenges – whether that be quick and easily repeatable deployments, resiliency or a need for local compute without the need for local IT support. So how should IT professionals responsible for edge computing installations evaluate various micro data center choices? First, it is important to look for micro data center offerings that are a pre-configured, pre-tested, pre-integrated solution that offers hyperconverged computing, operations software, environmental monitoring, power distribution, and power protection all in a secure rack. There is also the practical issue of space considerations at deployment sites. Many micro data center options require very little physical space for the system and the time to configure it is minimized. Lastly, as many remote locations may not have IT staff on-site, a simpler plug and play micro data center solution may be needed. This option only requires local sites to provide a power and communications connection to turn the system on and begin running applications and processing local data. As is often the case, the vendor community has come together to collectively respond to these new business requirements and developed solutions that address the issues of high data transmission costs, and latency-free performance. One example of the results of this type of collaboration is called “Data Center in a Box,” and it was created through the joint efforts of Scale Computing, Ingram Micro and APC by Schneider Electric. A growing electronics company recently decided to deploy Data Center in a Box solutions across their entire enterprise. Over the last several years, the company had acquired numerous smaller businesses. As a result, they found themselves having to manage multiple small antiquated data centers distributed across the globe, all with distinct technologies and modes of operation. In order to avoid the cost and time required to manage such a labor-intensive patchwork environment, the corporate leadership decided to standardize on the Data Center in a Box solution for each location, in order to simplify management and enhance systems reliability and availability. With a “single pane” management approach, all of the sites now have the ability to operate across the globe in a consistent manner with limited downtime. Want to learn more about how micro data centers can help deliver Certainty in a Connected World to businesses? Discover how micro data centers and Data Center in a Box solutions can increase reliability and address the needs of the Internet of Things (IoT) edge computing requirements.